Experts recommend that children receive several eye exams before starting school. Infants should receive their first comprehensive eye exam around 12 months of age. Children should have an eye exam around age three, and again when they reach age five or six. 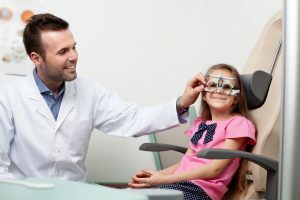 Before reaching first grade, parents are strongly encouraged to have their children receive a full eye exam to make sure the child has no visual problems as they start elementary school. A condition known as amblyopia can occur when one eye fails to develop properly and can lead to permanent vision loss unless caught early. The critical treatment period is before age 7.